For the writer, see Hermann Hesse. For other persons, see Hesse (surname). For other uses, see Hesse (disambiguation). (2017-12-31) "Bevölkerung der hessischen Gemeinden". Hessisches Statistisches Landesamt (in German). September 2018. Hesse (/ˈhɛsə/) or Hessia (German: Hessen [ˈhɛsn̩], Hessian dialect: Hesse [ˈhɛzə]), officially the State of Hesse (German: Land Hessen), is a federal state (Land) of the Federal Republic of Germany, with just over six million inhabitants. The state capital is Wiesbaden; the largest city is Frankfurt am Main. Look up Hesse in Wiktionary, the free dictionary. The German name Hessen, like the name of other German regions (Schwaben "Swabia", Franken "Franconia", Bayern "Bavaria", Sachsen "Saxony") is derived from the dative plural form of the name of the inhabitants or eponymous tribe, the Hessians (Hessen, singular Hesse), short for the older compound name Hessenland ("land of the Hessians"). The Old High German form of the name is recorded as Hessun (dative plural of Hessi), in Middle Latin as Hassia, Hessia, Hassonia. The name of the Hessians ultimately continues the tribal name of the Chatti. The ancient name Chatti by the 7th century is recorded as Chassi, and from the 8th century as Hassi or Hessi. An inhabitant of Hesse is called a "Hessian" (German: Hesse (masculine) or Hessin (feminine), plural Hessen). The American English term Hessian for 18th-century British auxiliary troops originates with Landgrave Frederick II of Hesse-Cassel hiring out regular army units to the government of Great Britain to fight in the American Revolutionary War. The territory of Hesse was delineated only in 1945, as Greater Hesse, under American occupation. It corresponds only loosely to the medieval Landgraviate of Hesse. In the 19th century, prior to the unification of Germany, the territory of what is now Hesse comprised the territories of Grand Duchy of Hesse, the Duchy of Nassau, the free city of Frankfurt and the Electorate of Hesse (also known as Hesse-Cassel). The Central Hessian region was inhabited in the Upper Paleolithic. Finds of tools in southern Hesse in Rüsselsheim suggest the presence of Pleistocene hunters about 13,000 years ago. A fossil hominid skull that was found in northern Hesse, just outside the village of Rhünda, has been dated at 12,000 years ago. The Züschen tomb (German: Steinkammergrab von Züschen, sometimes also Lohne-Züschen) is a prehistoric burial monument, located between Lohne and Züschen, near Fritzlar, Hesse, Germany. Classified as a gallery grave or a Hessian-Westphalian stone cist (hessisch-westfälische Steinkiste), it is one of the most important megalithic monuments in Central Europe. Dating to c. 3000 BC, it belongs to the Late Neolithic Wartberg culture. An early Celtic presence in what is now Hesse is indicated by a mid-5th-century BC La Tène-style burial uncovered at Glauberg. The region was later settled by the Germanic Chatti tribe around the 1st century BC, and the name Hesse is a continuation of that tribal name. The ancient Romans had a military camp in Dorlar, and in Waldgirmes directly on the eastern outskirts of Wetzlar was a civil settlement under construction. Presumably, the provincial government for the occupied territories of the right bank of Germania was planned at this location. The governor of Germania, at least temporarily, likely had resided here. The settlement appears to have been abandoned by the Romans after the devastating Battle of the Teutoburg Forest failed in the year AD 9. The Chatti were also involved in the Revolt of the Batavi in AD 69. Hessia, from the early 7th century on, served as a buffer between areas dominated by the Saxons (to the north) and the Franks, who brought the area to the south under their control in the early sixth century and occupied Thuringia (to the east) in 531. Hessia occupies the northwestern part of the modern German state of Hesse; its borders were not clearly delineated. Its geographic center is Fritzlar; it extends in the southeast to Hersfeld on the Fulda River, in the north to past Kassel and up to the rivers Diemel and Weser. To the west, it occupies the valleys of the Rivers Eder and Lahn (the latter until it turns south). It measured roughly 90 kilometers north-south, and 80 north-west. The area around Fritzlar shows evidence of significant pagan belief from the 1st century on. Geismar was a particular focus of such activity; it was continuously occupied from the Roman period on, with a settlement from the Roman period, which itself had a predecessor from the 5th century BC. Excavations have produced a horse burial and bronze artifacts. A possible religious cult may have centered on a natural spring in Geismar, called Heilgenbron; the name "Geismar" (possibly "energetic pool") itself may be derived from that spring. The village of Maden, Gudensberg [de], now a part of Gudensberg near Fritzlar and less than ten miles from Geismar, was likely an ancient religious center; the basaltic outcrop of Gudensberg is named after Wodan, and a two-meter tall quartzite megalith called the Wotanstein is at the center of the village. By the mid-7th century, the Franks had established themselves as overlords, which is suggested by archeological evidence of burials, and they built fortifications in various places, including Christenberg. By 690, they took direct control over Hessia, apparently to counteract expansion by the Saxons, who built fortifications in Gaulskopf and Eresburg across the River Diemel, the northern boundary of Hessia. The Büraburg (which already had a Frankish settlement in the sixth century) was one of the places the Franks fortified to resist the Saxon pressure, and according to John-Henry Clay, the Büraburg was "probably the largest man-made construction seen in Hessia for at least seven hundred years". Walls and trenches totaling one kilometer in length were made, and they enclosed "8 hectares of a spur that offered a commanding view over Fritzlar and the densely-populated heart of Hessia". Following Saxon incursions into Chattish territory in the 7th century, two gaue had been established; a Frankish one, comprising an area around Fritzlar and Kassel, and a Saxonian one. In the 9th century, the Saxon Hessengau also came under the rule of the Franconians. The Ludovingian coat of arms with its lion rampant barry argent and gules, the so-called lion of Hesse. In the 12th century, Hessengau was passed to Thuringia. In the War of the Thuringian Succession (1247–1264), Hesse gained independence and became a Landgraviate within the Holy Roman Empire. It shortly rose to primary importance under Landgrave Philip the Magnanimous, who was one of the leaders of German Protestantism. After Philip's death in 1567, the territory was divided among his four sons from his first marriage (Philip was a bigamist) into four lines: Hesse-Kassel (or Hesse-Cassel), Hesse-Darmstadt, Hesse-Rheinfels, and the also previously existing Hesse-Marburg. As the latter two lines died out quite soon (1583 and 1605, respectively), Hesse-Kassel and Hesse-Darmstadt were the two core states within the Hessian lands. Several collateral lines split off during the centuries, such as in 1622, when Hesse-Homburg split off from Hesse-Darmstadt. In the late 16th century, Kassel adopted Calvinism, while Darmstadt remained Lutheran and subsequently the two lines often found themselves on different sides of a conflict, most notably in the disputes over Hesse-Marburg and in the Thirty Years' War, when Darmstadt fought on the side of the Emperor, while Kassel sided with Sweden and France. The Landgrave Frederick II (1720–1785) ruled as a benevolent despot, from 1760 to 1785. He combined Enlightenment ideas with Christian values, cameralist plans for central control of the economy, and a militaristic approach toward diplomacy. He funded the depleted treasury of the poor nation by loaning 19,000 soldiers in complete military formations to Great Britain to fight in North America during the American Revolutionary War, 1776–1783. These soldiers, commonly known as Hessians, fought under the British flag. The British used the Hessians in several conflicts, including in the Irish Rebellion of 1798. For further revenue, the soldiers were loaned to other places as well. Most were conscripted, with their pay going to the Landgrave. The revolution of 1918 transformed Hesse-Darmstadt from a monarchy to a republic, which officially renamed itself "Volksstaat Hessen" (People's State of Hesse). The parts of Hesse-Darmstadt on the western banks of the Rhine (province Rheinhessen) were occupied by French troops until 1930 under the terms of the Versailles peace treaty that officially ended World War I in 1919. In 1929 the Principality of Waldeck was dissolved and incorporated into Hesse-Nassau. After World War II, the Hessian territory west of the Rhine was again occupied by France, whereas the rest of the region was part of the US occupation zone. The French separated their part of Hesse from the rest of the region and incorporated it into the newly founded state of Rhineland-Palatinate (Rheinland-Pfalz). The United States, on the other side, proclaimed the state of Greater Hesse (Groß-Hessen) on 19 September 1945, out of Hesse-Darmstadt and most of the former Prussian province of Hesse-Nassau. On 4 December 1946 Groß-Hessen was officially renamed Hessen. Hesse in the 1940s received more than a million displaced ethnic Germans. Due to its proximity to the Inner German border, Hesse became an important location of NATO installations in the 1950s, especially military bases of the US V Corps and United States Army Europe. The first elected minister president of Hesse was Christian Stock, followed by Georg-August Zinn (both Social Democrats). The German Social Democrats gained an absolute majority in 1962 and pursued progressive policies with the so-called Großer Hessenplan. The CDU gained a relative majority in the 1974 elections, but the Social Democrats continued to govern in a coalition with the FDP. Hesse was first governed by the CDU under Walter Wallmann during 1987–1991, replaced by a SPD-Greens coalition under Hans Eichel during 1991–1999. From 1999, Hesse was governed by the CDU under Roland Koch (retired 2010) and Volker Bouffier (incumbent as of 2018). Frankfurt during the 1960s to 1990s developed into one of the major cities of West Germany. As of 2016, 12% of the total population of Hesse lived in the city of Frankfurt. Situated in west-central Germany, The state of Hesse borders the German states of (starting in the north and proceeding clockwise) Lower Saxony, Thuringia, Bavaria, Baden-Württemberg, Rhineland-Palatinate, and North Rhine-Westphalia. Most of the population of Hesse lives in the southern part, in the Rhine Main Area. The principal cities of the area include Frankfurt am Main, Wiesbaden, Darmstadt, Offenbach, Hanau, Gießen, Wetzlar, and Limburg. Other major towns in Hesse are Fulda in the east, and Kassel and Marburg an der Lahn in the north. The densely populated Rhine-Main region is much better developed than the rural areas in the middle and northern parts of Hesse. The Rhine borders Hesse on the southwest without running through the state, only one oxbow lake —– the so-called Alt-Rhein —– runs through Hesse. The mountain range between the Main and the Neckar Rivers is called the Odenwald. The plain between the rivers Main, Rhine, and Neckar, and the Odenwald Mountains is called the Ried. Hessen has been a parliamentary republic since 1918, except during the Third Reich 1933-1945. The German federal system has elements of exclusive federal competences, shared competences, and exclusive competences of the federal states. Hessen is famous for having a rather brisk style in its politics with the ruling parties being either the center-right Christian Democratic Union (CDU) or the center-left Social Democratic Party of Germany (SPD). Due to the Hessian electoral laws, the biggest party normally needs a smaller coalition partner. As Hesse is a federal state, its constitution combines the offices of the head of state and head of government in one office called the Minister-President (German: Ministerpräsident) which is comparable to the office of a prime minister. In the framework of the German federation, the President of Germany is de facto Hesse's head of state. In the 2018 state elections the two leading parties, CDU and SPD, lost 11.3% (7 seats) and 10.9% (8 seats) of the vote respectively. The Green party, a member of Hesse's previous governing coalition with CDU, gained 8.7% (16 seats). The largest gains during the election were made by Alternative for Germany (AfD) at 13.1%. As AfD had not passed the 5% threshold in the 2013 state election, this marked its first entry into the Hessian parliament (Hessischer Landtag). The two other parties also made gains. The major losses of the two leading parties (whose coalition made up the federal cabinet during the election) closely mirrors the results of the 2018 state elections in Bavaria. In the current parliament the conservative CDU holds a 40 seats, the centre-left SPD and the leftist Green party each hold 29 seats, the far-right AfD holds 19 seats, the liberal FDP party holds 11 seats and the socialist party Die Linke holds 9 seats. The flag colors of Hesse are red and white. The Hessian coat of arms shows a lion rampant striped with red and white. The official anthem of Hesse is called "Hessenlied" ("Song of Hesse") and was written by Albrecht Brede (music) and Carl Preser (lyrics). Hesse has a population of over 6 million, nearly 4 million of which is concentrated in the Rhein-Main region (German: Rhein-Main Gebiet) in the south of the state, an area that includes the most populous city, Frankfurt am Main, the capital Wiesbaden, and Darmstadt and Offenbach. The population of Hesse is predicted to shrink by 4.3% by 2030, with the biggest falls in the north of the state, especially in the area around the city of Kassel. Frankfurt is the fastest growing city with a predicted rise in population of 4.8% by 2030. Frankfurt's growth is driven by its importance as a financial centre and it receives immigrants from all over the world: in 2015 over half of the city's population had an immigrant background. German is the official language, but many Hessian people also speak a Rhine Franconian dialect known as Hessisch. The Hessian government has overall responsibility for the education within the state. 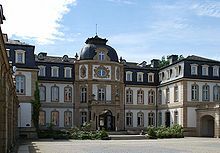 Hesse has several universities, including Technische Universität Darmstadt, Goethe University Frankfurt, and the University of Marburg, one of the oldest universities in Germany. There are many international schools in Hessen, primarily centred in and around Frankfurt. The southern parts of Hesse were[when?] deeply influenced by the fact that they belonged to the Grand Duchy of Hessen, an independent state until 1871, while the northern region of what is today the State of Hessen came under strong Prussian influence. Darmstadt has a rich cultural heritage as the former seat of the Landgraves and Grand Dukes of Hesse. It is known as centre of art nouveau and modern architecture and there are also several important examples of 19th century architecture influenced by British and Russian imperial architecture due to close family ties of the Grand Duke's family to the reigning dynasties in London and Saint Petersburg in the Grand Duchy period. Darmstadt is an important centre for music, home of the Darmstadt School of 20th century composers and the Jazz Institute Darmstadt, Europe's largest public jazz archive. Frankfurt am Main is a major international cultural centre. Over 2 million people visit the city's approximately 60 exhibition centres every year. Amongst its most famous art galleries are the Schirn Kunsthalle, a major centre for international modern art, and the Städel, whose large collections include over 3000 paintings, 4000 photographs, and 100,000 drawings including works by Picasso, Monet, Rembrandt and Dürer. Goethe was born in Frankfurt and there is a museum in his birthplace. Frankfurt has many music venues, including an award winning opera house, the Alte Oper, and the Jahrhunderthalle. Its several theatres including the English Theatre, the largest English-speaking theatre on the European continent. Kassel has many palaces and parks, including Bergpark Wilhelmshöhe, a Baroque landscape park and UNESCO World Heritage site. The Brothers Grimm lived and worked in Kassel for 30 years and the recently opened Grimmwelt museum explores their lives, works and influence and features their personal copies of the Children's and Household Tales, which are on the UNESCO World Heritage "Memory of the World" Document register. The Fridericianum, built in 1779, is one of the oldest public museums in Europe. Kassel is also home to the documenta, a large modern art exhibition that has taken place every five years since the 1950s. The Messel Fossil Pit. Exhibits from the Messel Pit can be seen in Messel town museum, the Museum of Hessen in Darmstadt, and the Senckenberg Museum in Frankfurt. The Saalburg, part of the Roman Limes. Outside Frankfurt, notable professional sports teams include SV Darmstadt 98, Marburg Mercenaries, Gießen 46ers, MT Melsungen, VfB Friedberg, and the Kassel Huskies. The Hessian state broadcasting corporation is called HR (Hessischer Rundfunk). HR is a member of the federal ARD broadcasting association. HR provides a statewide TV channel as well as a range of regional radio stations (HR 1, HR 2, HR 3, HR 4, you fm and HR info). Besides the state run HR, privately run TV stations exist and are an important line of commerce. Among the commercial radio stations that are active in Hesse Hit Radio FFH, Planet Radio, Harmony FM, Radio BOB and Antenne Frankfurt are the most popular. The Rhine-Main Region has the second largest industrial density in Germany after the Ruhr area. The main economic fields of importance are the chemical and pharmaceutical industries with Sanofi, Merck, Heraeus, Messer Griesheim and Degussa. In the mechanical and automotive engineering field Opel in Rüsselsheim is worth mentioning. Frankfurt is crucial as a financial center, with both the European Central Bank and the Deutsche Bundesbank's headquarters located there. Numerous smaller banks and Deutsche Bank, DZ Bank, KfW Bank, Commerzbank are also headquartered in Frankfurt, with the offices of several international banks also being housed there. Frankfurt is also the location of the most important German stock exchange, the Frankfurt Stock Exchange. Insurance companies have settled mostly in Wiesbaden. The city's largest private employer is the R+V Versicherung, with about 3,900 employees, other major employers are DBV-Winterthur, the SV SparkassenVersicherung and the Delta Lloyd Group. The leather industry is predominantly settled in Offenbach. Frankfurt Airport is the largest employer in Germany with more than 70.000 employees. Companies with an international reputation are located outside the Rhine-Main region in Wetzlar. There the center of the optical, electrical and precision engineering industries Leitz, Leica, Minox, Hensoldt (Zeiss) and Buderus and Brita with several plants in central Hesse. In the east Fulda there is the rubber plant (Fulda Reifen). In northern Hesse, in Baunatal, Volkswagen AG has a large factory that manufactures spare parts. Bombardier has a large plant that manufactures Locomotives in Kassel. In August 2008 there were 199,573 people unemployed in Hesse. The unemployment rate is thus 6.4% (August 2007: 7.6%). With 3.8% the Hochtaunuskreis has the lowest rate, while the independent city of Kassel has the highest rate nationally with 12.1%. In October 2018 the unemployment rate stood at 4.4% and was the lower than the national average. Hesse has one of the best transportation networks in Europe. Many trans-European and German motorways, high-speed rail lines, and waterways cross Hesse. Frankfurt International Airport is Germany's largest and Europe's third-largest airport (after London Heathrow and Paris-Charles de Gaulle). Frankfurt (Main) Hauptbahnhof is Germany's second-busiest railway station by passengers but the busiest in terms of traffic. Hesse has a dense highway network with a total of 24 motorways. The internationally important motorway routes through Hesse are the A3, A5, and A7. Close to Frankfurt Airport is the Frankfurter Kreuz, Germany's busiest and one of Europe's busiest motorway junctions, where the motorways A3 (Arnhem-Cologne-Frankfurt-Nuremberg-Passau) and A5 (Hattenbach-Frankfurt-Karlsruhe-Basel) intersect. The A5 becomes as wide as four lanes in each direction near the city of Frankfurt am Main, and during the rush-hour, it is possible to use the emergency lanes on the A3 and A5 motorway in the Rhine-Main Region, adding additional lanes. Other major leading Hesse highways are the A4, the A44, the A45, the Federal Highway A66 and the A67. There are also a number of smaller motorways and major trunk roads, some of which are dual carriageways. Hesse is accessed by many major rail lines, including the high-speed lines Cologne–Frankfurt and Hanover–Würzburg. Other north-south connections traverse major east-west routes from Wiesbaden and Mainz to Frankfurt and from Hanau and Aschaffenburg to Fulda and Kassel. The Frankfurt Central Station is the most important hub for German trains, with over 1,100 trains per day. The region around Frankfurt has an extensive S-Bahn network, the S-Bahn Rhein-Main, which is complemented by many regional train connections. In the rest of the country, the rail network is less extensive. Since 2007, the region around Kassel has been served by the RegioTram, a tram-train-concept similar to the Karlsruhe model. Frankfurt Airport is by far the largest airport in Germany with more than 57 million passengers each year, is and among the world's ten largest. Frankfurt Egelsbach Airport lies to the south, and is frequented by general aviation and private planes. Kassel Airport offers a few flights to holiday destinations, but has struggled to compete. There are also a number of sports airfields. Low-cost airlines, especially Ryanair, use Frankfurt-Hahn Airport as a major base, although the airport is actually located about 100 km from Frankfurt in the neighbouring state of Rhineland-Palatinate. The DFS (German air traffic control) has its headquarters in Langen. ^ Baden-Württemberg, Statistisches Landesamt. "Bruttoinlandsprodukt – in jeweiligen Preisen – in Deutschland 1991 bis 2016 nach Bundesländern (WZ 2008) – VGR dL". www.vgrdl.de. Retrieved 16 March 2018. ^ "Definition of HESSE". www.merriam-webster.com. Retrieved 16 March 2018. ^ "Geschichte. Kurz und knapp - Geschichte - Identität - Region - Rheinhessen". Rheinhessen.de (in German). Retrieved 2018-05-13. ^ Gudmund Schütte, Our forefathers : The Gothonic nations : A manual of the ethnography of the Gothic, German, Dutch, Anglo-Saxon, Frisian and Scandinavian peoples, vol. 2 (1933), p. 191. ^ Christian Presche, Kassel im Mittelalter: Zur Stadtentwicklung bis 1367 vol. 1 (2013), p. 41. ^ "The Hessians, called, in the early history of Germany, Catti, lived in the present Hessia". The Popular Encyclopedia: Or, Conversations Lexicon vol. 3 (1862), p. 720. Occasional English use of Hessia is found until the present day, e.g. P.J.J. Welfens, Stabilizing and Integrating the Balkans, Springer Science & Business Media (2001), p. 119. ^ "Names and symbols of transfermium elements (IUPAC Recommendations 1997)". Pure and Applied Chemistry. 69.12 (1997), p. 2471. doi:10.1351/pac199769122471. ^ "Hessen - 60 stolze Jahre - Zeittafel 1945/1946". Archived from the original on 2006-10-17. Retrieved 2006-12-01. ^ "Our State". State of Hesse. Archived from the original on 6 January 2013. Retrieved 14 April 2011. ^ "„Ich kenne ein Land" | Informationsportal Hessen". www.hessen.de (in German). Retrieved 2018-05-13. ^ Baden-Württemberg, Statistisches Landesamt. "Gemeinsames Datenangebot der Statistischen Ämter des Bundes und der Länder". www.statistik-bw.de (in German). Retrieved 2018-05-12. ^ "Tabellen Bevölkerung". Statistik.Hessen (in German). 2017-09-18. Retrieved 2018-05-12. ^ "Bevölkerung in Hessen 2060 - Regionalisierte Bevölkerungsvorausberechnung für Hessen bis 2030 Basisjahr: 31.12.2014". www.statistik-hessen.de. Retrieved 2018-05-12. ^ "Frankfurt Population 2018 (Demographics, Maps, Graphs)". worldpopulationreview.com. Retrieved 2018-05-13. ^ "Bevölkerung". Statistische Ämter des Bundes Und der Länder. Retrieved 7 August 2018. ^ "Study in Hessen". www.study-in-hessen.de (in German). Retrieved 2018-05-13. ^ "Newcomers Network - Your Guide to Expatriate Life in Germany". www.newcomers-network.de. Retrieved 2018-05-13. ^ "Darmstädter Ferienkurse - Internationales Musikinstitut Darmstadt". Internationales Musikinstitut Darmstadt. Retrieved 2018-05-13. ^ "Jazzinstitut Darmstadt". www.jazzinstitut.de. Retrieved 2018-05-13. ^ "Frankfurt am Main: Museums". www.frankfurt.de. Retrieved 2018-05-13. ^ FRANKFURT, SCHIRN KUNSTHALLE (2016-04-28). "About us". SCHIRN KUNSTHALLE FRANKFURT. Retrieved 2018-05-13. ^ "About the Städel Museum". St��del Museum. Retrieved 2018-05-13. ^ "Frankfurt am Main: English Theatre". www.frankfurt.de. Retrieved 2018-05-13. 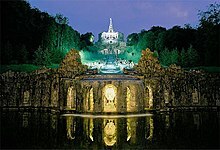 ^ "UNESCO world heritage site of bergpark wilhelmshöhe | Museumslandschaft Hessen Kassel". museum-kassel.de (in German). Retrieved 2018-05-13. ^ "Welcome to the GRIMM WORLD Kassel: GRIMMWELT". www.grimmwelt.de. Retrieved 2018-05-13. ^ Kassel, Stadt. "Stadtportal - Fridericianum". www.kassel.de (in German). Retrieved 2018-05-13. ^ "documenta". www.documenta.de. Retrieved 2018-05-13. ^ "UNESCO World Heritage Sites | Hessen Tourismus". www.languages.hessen-tourismus.de. Retrieved 2018-05-13. ^ "Wilhelmshöhe Palace and Park | Hessen Tourismus". www.languages.hessen-tourismus.de. Retrieved 2018-05-13. ^ "Germany's Ancient Beech Forests | Hessen Tourismus". www.languages.hessen-tourismus.de. Retrieved 2018-05-13. ^ "Lorsch – Benedictine Abbey and Altenmünster | Hessen Tourismus". www.languages.hessen-tourismus.de. Retrieved 2018-05-13. ^ "Messel Pit Fossil Site | Hessen Tourismus". www.languages.hessen-tourismus.de. Retrieved 2018-05-13. ^ "Home". www.grube-messel.de (in German). Retrieved 2018-05-13. ^ "Messel Pit - Hessisches Landesmuseum". www.hlmd.de. Retrieved 2018-05-13. ^ "SENCKENBERG world of biodiversity | Museums | Museum Frankfurt | The Museum | Exhibitions | World natural heritage "." www.senckenberg.de. Retrieved 2018-05-13. ^ "Roman Limes | Hessen Tourismus". www.languages.hessen-tourismus.de. Retrieved 2018-05-13. ^ "Bruttoinlandsprodukt". Volkswirtschaftliche Gesamtrechnungen (in German). Hessisches Statistisches Landesamt. 2012. Archived from the original on 14 September 2012. Retrieved 27 March 2013. ^ "EURES - Labour market information - Hessen - European Commission". ec.europa.eu. Retrieved 2018-02-02. ^ "Bahn". Frankfurt am Main. Retrieved 5 September 2018. Rau, Reinhold (1968). Briefe des Bonifatius, Willibalds Leben des Bonifatius; Nebst Einigen Zeitgenössischen Dokumenten. Ausgewählte Quellen zur Deutschen Geschichte des Mittelalters (in German). IVb. Darmstadt: Wissenschaftliche Buchgesellschaft. Wikivoyage has a travel guide for Hesse.